Creating tracks at home can be very intensive in time, so I’m always looking for a better way to bring a larger sound to a track with less effort. One of the big gaps for me has been the drum parts. I’ve evaluated a few options, and finally dived into BFD3 for this latest project that is a post-rock style track. 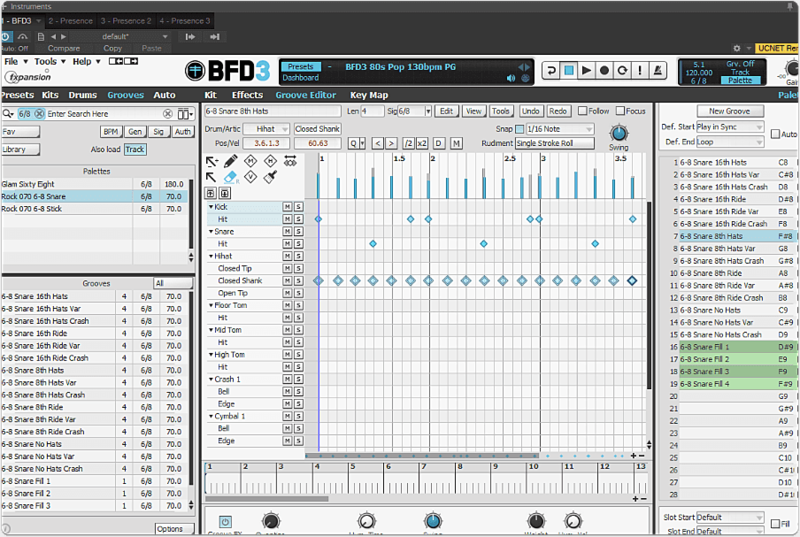 This was my first time diving into BFD3 for a full song, so I had a bit to learn. Disclaimer: BFD3 generously provided me with a copy to evaluate. This doesn’t affect my reviews, as I just love dig in and recommend good software! I was using this in Presonus Studio One. I created a drum track and then started to explore. I started my exploration based on using the Groove Editor, as I wanted to benefit from the library of preset grooves that were already created, and use these with some modifications to be the drum parts for me song, allowing me to hopefully create the track I wanted quickly. There is a lot of functionality I’m not going to dive into, such as the vast array of microphone adjustments, compression options, and other mixing options. My focus is going to be as a songwriter, how could I use this to help me generate a believable drum track for my song without it being an ordeal. 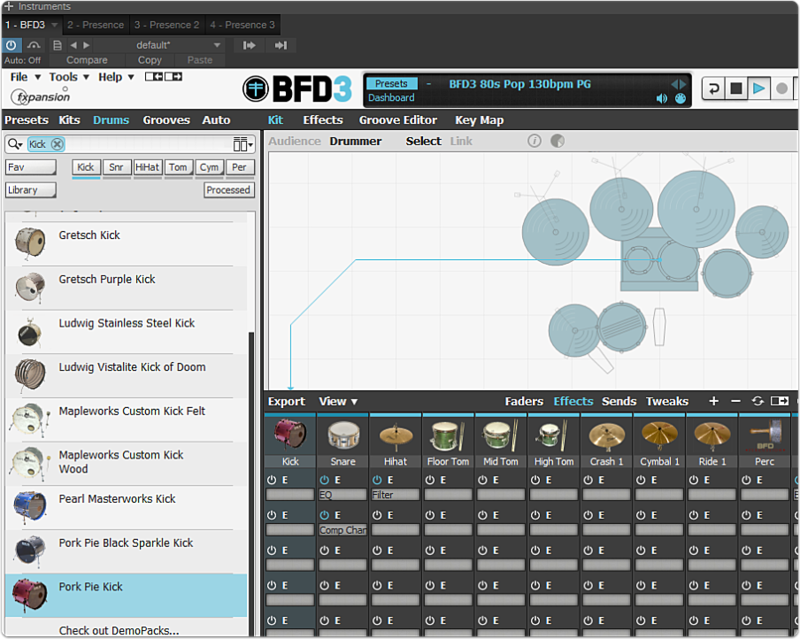 One thing that was really easy to do with BFD3 was modify the kit configuration. I liked the sound of Pork Pie Kick for this song, so I just played a groove, and then switched it over with the checkbox (on hover). #Grooves The Grooves section provides a preset set of associated rhythms to allow you to easily prepare a song based on related rhythms. This is ideal for helping you create a song quickly by finding associated rhythms. This is really important to a natural sounding drum part. You definitely do not want everything at the same velocity as no real drummer would do this. There are some easy ways to adjust the velocity as well as the humanization of the rhythm in both Presonus Studio One 3 and BFD3 plugin. In this example, I adjust it in BFD3 directly. One other cool feature for quickly pumping out some grooves is the ability to “paint” the rudiment you’ve selected. This means you could easily pick some drag paradiddles on the snare without having to click each point in time. I found this incredible helpful for creating some interesting grooves. However, the flexibility in editing with the easy humanization and editing of the kit made up for this. I think the vast sound library of plugin packs is what is designed to expand this, so I’ll probably cover some of those later to evaluate if they fill in the gap on providing a even larger variety of preset grooves for the wannabe composer. Note that the library is around 40GB for the initial load, so my isolated 6⁄8 groove test isn’t reflective of the rest of the available library. There is a lot to work with, and the expansion libraries seem to be pretty vast in number. Check out a trial if you want to give it a shot and post some feedback below on what you think. Remember, I’m not an affiliate, or getting paid for anything on this, I just like reviewing and referring folks to good software. Good luck!